Be the first to share your favorite memory, photo or story of Mae. This memorial page is dedicated for family, friends and future generations to celebrate the life of their loved one. 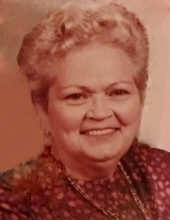 Mrs. Vivienne Mae Higgason Noble Stuber of Adair County, Kentucky, daughter of the late Ned Higgason and Theodocia Chaudoin Higgason, was born on Sunday, May 4, 1930 in Green County and departed this life on Monday, January 21, 2019 at her home. She was 88 years, 8 months, and 17 days of age. She had made a profession of faith in Christ and attended the Pickett's Chapel United Methodist Church in Portland Community of Adair County. She was also a retired Beautician. She united in marriage to Claude Noble who preceded her in death. She later united in marriage to Ray E. Stuber who also preceded her in death on September 19, 2016. Survivors include two daughters: Nancy Noble and Dianna Lynn Hartman both of Adair County; a son: Claude Noble of Munfordville; six grandchildren: Jesse Noble Hartman, Crystal Lynn Byrne, Claudia Jill Adcock, Claude Noble III, Jennifer Faulkner, and Malena Noble; 10 great-grandchildren; 4 great-great-grandchildren; and a host of other relatives and friends. The funeral services for Mrs. Mae Higgason Noble will be conducted at 11:00 A.M., Central Time, Wednesday, January 23, 2019 at the Cowherd and Parrott Funeral Home with burial to follow in the Pleasant Grove Cemetery. Bro. David Kemp officiating. Visitation is requested from 4 P.M. until 8 P.M., Central Time, Tuesday at the Cowherd and Parrott Funeral Home and after 7 A.M., Wednesday until time of the funeral service. To plant a tree in memory of Mae Higgason Noble Stuber, please visit our Tribute Store. "Email Address" would like to share the life celebration of Mae Higgason Noble Stuber. Click on the "link" to go to share a favorite memory or leave a condolence message for the family.